"Cherries and chocolate are an all time favorite combination. This chocolate fudge has candied cherries and almonds throughout, and is topped with more cherries and pecans." This fudge is delicious! I followed the recipe exactly and found the consistancy perfect and the flavor excellent. 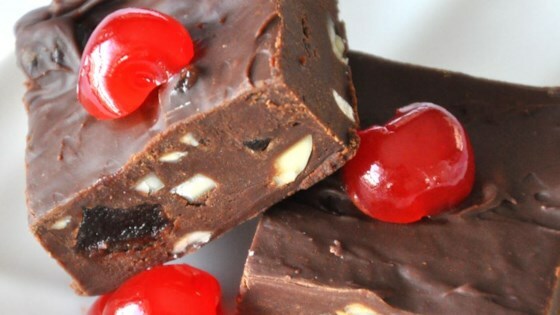 What an awesome fudge recipe! I made this for a birthday present for a co worker and she loved it! Thanks for the recipe. I MADE THIS AS GIFTS AND EVERYONE LOVED IT. This is wonderful and sets up nicely. very easy to make and I had no problems with the fudge setting up and I live in high altitude. These tasetd like chocolate covered cherries and we love them!